1964 Daytona Blue Corvette coupe with black interior, with a “NOM” 327/ 350 HP backed by a 4 speed manual transmission and Hurst Shifter. One of the previous owners replaced the hood with a Corvette 1967 Corvette “Big Block” hood with a White Stinger stripe. 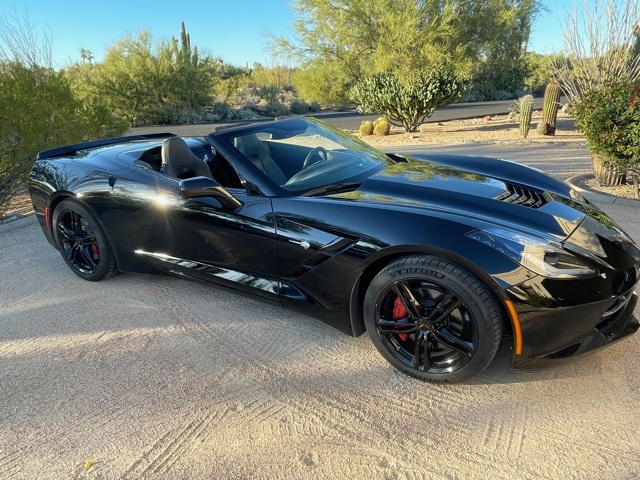 Options include; power steering, power brakes AM/FM radio, factory GM side pipes, and aftermarket Cragar wheels mounted with B F Goodrich tires. The very nice interior includes a fresh gauge cluster and Quartz Clock. It has a nicely detailed engine compartment. This is Great driving car with nice frame and excellent paint and is one of the nicest looking ’64 Coupes that we have sold, and will be a blast to drive.